Ever since I moved to the US I've been a sucker for all the types of foods that you can't get in Croatia. Or that you couldn't get there while I was still living there, I think that situation has greatly improved in the last ten years. On the top of my favorite cuisines are Thai and Indian food, and my absolute favorite among those are coconut and curry based soups, stews and sauces. 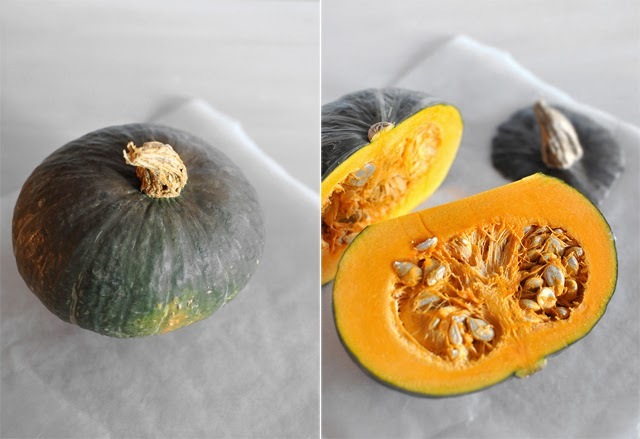 I was really craving a soup yesterday, and I am also obsessed with pumpkin and squash in just about anything lately, so that is how this soup came to be. 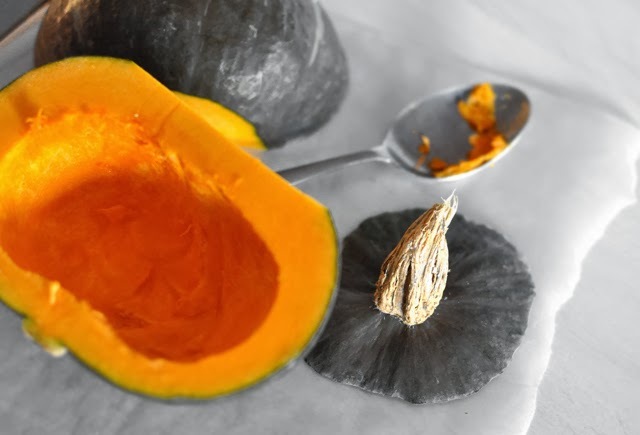 I used Kabocha squash in the soup and it works really well because coconut milk brings a sweetness already and Kabocha adds to that. It does makes for a heartier soup, and I thought it was a better and healthier choice than potatoes that came to my mind first. Because, I am a girl from Croatia, and we like our potatoes. This was my first time ever trying this squash, and definitely first time cooking with it. But I treated it just like I would cooking with acorn or butternut squash and it turned out great. I didn't have a lot of time to roast it first, which I would prefer, and you can certainly go that route, so I decided to saute it quickly in the pan before adding it to the soup. This helped both with cooking it faster and adding to its flavor (rather than just cooking in the soup itself only) since I seasoned it separately and caramelized it a bit. It's a great option if you are in a time crunch! 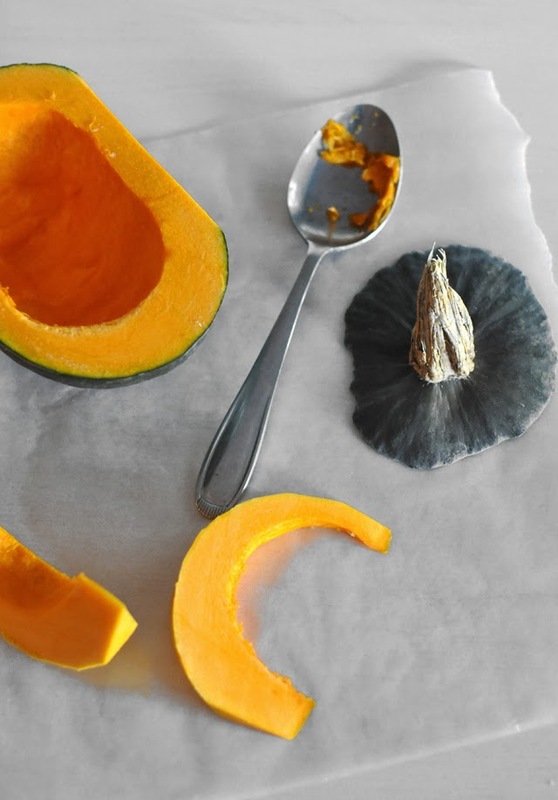 Peel and cut your Kabocha squash in about 1/2" pieces. Saute on little canola oil until tender (about ten minutes). Season it with salt and pepper half way through the cooking. Cook the onions until they are translucent and beginning to brown, then add the grated carrots and cook for a few more minutes. Add the minced garlic and ginger (and Thai pepper if you are using it) and cook for another minute. Add the lentils and the vegetable stock and season with salt and pepper. Cook for about 20 minutes and then add the Kabocha Squash, cilantro, curry powder and coconut milk. 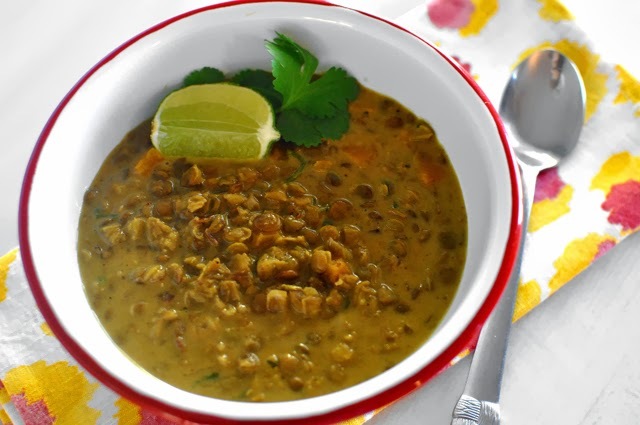 Cook for another 10 minutes or until the lentils are nice and tender. Remove from the heat and add lime juice to it, stir well. Serve in a bowl and garnish with some fresh cilantro and a wedge of lime. 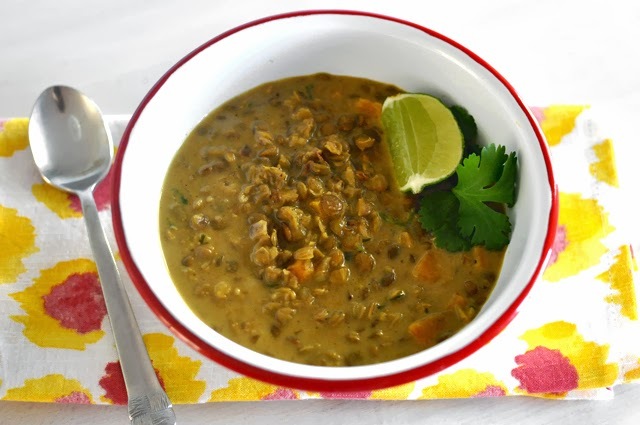 It is a warm and filling soup that is very satisfying to me because of all the wonderful spices and flavors, but it is also refreshing because of the lime. Perfect for Fall and a nice lunch!